I don’t even know where to start with this episode, so I guess my first question is this: Does someone hiking in a fictional story always have to turn their ankle? I have not read Drums of Autumn, on which Season Four of Outlander is based, in a few years. I also chose not to re-read it before the season began, because I did not want to be constantly comparing them—this is a review of the TV show, not the book. But a lot of this episode seemed like new information. Bree heads through the stones, turns her ankle and acts like a very prepared Girl Scout. Roger has shaved his beard and changed into old-fashioned clothes and heads through the stones himself. And Outlander loves to link people in a myriad of ways, through loose connections and mirrored relationships. 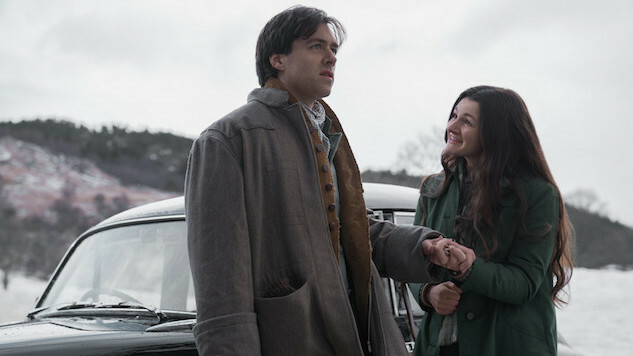 Much of this episode is about Bree’s relationship with Frank. The episode doesn’t make it explicit, but we’re definitely led to think that he knows what will happen to Jamie and Claire: For instance, Frank has a copy of the Wilmington Gazette. He is a historian, and it makes sense that he could figure that out. But I do not remember that from the book. (Purists will certainly let me know in the comments if I’m wrong about that.) However, I’m not wrong that’s what the show wants you to think. It feels like that is the reason for the divorce: He knows Claire goes back. In fact, he knows before anyone else. It’s clear that he’s still in love with Claire, but he knows he can never really have her. Bree ends up with Laoghire, the woman who has been hurt by Jamie, and has felt the sting of Jamie and Claire’s undying love. Outlander makes you feel like Jamie and Claire’s love ruined other people’s lives. And yet, 20 years of their lives were ruined because of their love for Bree… It’s a tangled web. Laoghire starts out being nice to Bree, mothering her just like Claire has mothered her child, Marsali. But as soon as she finds out who Bree really is, she loses it. Meanwhile, Roger has found his way to a boat and is ready to head to North Carolina. Too bad these two didn’t know about the stones nearer to the States! The overseas travel would have been much easier. Roger not only has to take a long sea cruise, but he has jumped aboard a ship with Stephen Bonnet. You remember, the guy who attacked Jamie and Claire after they tried to help him? At any rate, things are not going well. Bonnet seems nice, but like Laoghire, has a devil within. Only his devil doesn’t just try to kill people—he actually does. He throws a little girl who gets smallpox overboard, and then just keeps throwing people off. Had he never heard of a quarantine? Ultimately, Roger steps in to help a mother and infant, and you think Bonnet is going to kill him. But like a game of cat and mouse, the episode ends with Roger alive on the boat. Once Laoghire loses her mind and says she wants Bree to burn at the stake just like she tried to have Claire killed, It turns out that Joanie, Bree’s not really stepsister, rescues her and takes her over to her Uncle Ian and Lallybroch. He helps Bree find her way to a ship so she can sail to North Carolina and gives her instructions to find Aunt Jocasta at River Run. This episode, though, was really about Bree and Frank. She seems to get a blessing for her journey from him. Jamie maybe be her biological parent, but it’s clear that Frank is her father.